At least 330 people were killed and almost 4,500 other injured after a 7.3-magnitude earthquake struck near the Iran's border with Iraq. More than 100 aftershocks were registered. The U.S. Geological Survey said the quake was recorded at 9:18 p.m. local time (1:18 p.m. ET) Sunday. It measured the quake at a magnitude 7.3, while Iraq's state geologists said it was magnitude 7.5. Iran's state-run news agency raised the death toll to 328 people early Monday. State television said some 3,950 were injured. 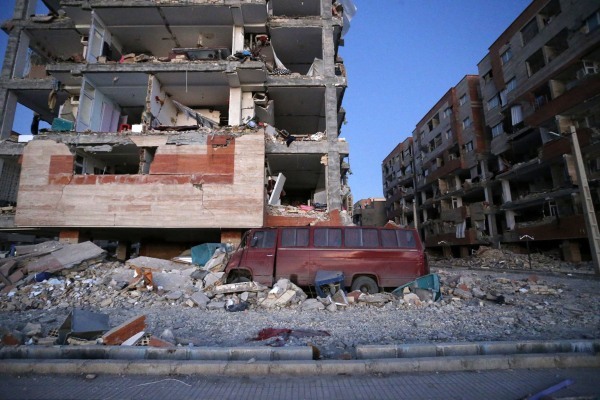 Iraq's Interior Ministry confirmed that seven people in the country were killed by the quake, with 535 people wounded. The quake was felt as far west as the Mediterranean coast. Its worst damage appeared to be in Iran's western Kermanshah province, which sits in the Zagros Mountains that divide Iran and Iraq. Kokab Fard, a 49-year-old housewife in the Iranian city of Sarpol-e-Zahab, told The Associated Press she could only flee empty-handed when her apartment complex collapsed. "Immediately after I managed to get out, the building collapsed," Fard said. "I have no access to my belongings." Many houses in rural areas of Iran are made of mud bricks that can crumble easily in a quake. Stephen Hicks, a seismologist at the University of Southampton in England, said that in a region where earthquakes are common, Sunday's quake appeared to be the largest in "a long time." Iran sits on many major fault lines and is prone to quakes. In 2003, a magnitude 6.6 earthquake flattened the historic city of Bam, killing 26,000 people. "I was sitting with my kids having dinner and suddenly the building was just dancing in the air," said Majida Ameer, who told Reuters she ran out of her building in the city's Salihiya district with her three children. "I thought at first that it was a huge bomb. But then I heard everyone around me screaming: 'Earthquake!'" At her home in the Iraqi city of Irbil, about 170 miles northwest of the epicenter, Lana Serwan said the temblor lasted for a minute. Another Irbil resident, Manar Ksebeh, 26, said he was in his 12th-floor apartment when he heard people running and shouting. So he fled down his building's stairwell. Video from Sulaymānīyah, Iraq — 48 miles southeast of the epicenter — showed people fleeing a coffee shop as a glass door appeared to break. Other footage posted to social media showed a swinging chandelier in an apartment in Israel and people who evacuated high-rise buildings in Kuwait lining the streets.